The Ranger is a treble/full range booster based on the legendary “Dallas Rangemaster.” The original signal path is still there, unchanged, though the Ranger uses metal film resistors, which are less noisy than the original carbon resistors. The Dallas Rangemaster was not a stompbox, but was actually designed to sit on top of the amp. It had a toggle switch to turn it on or off. The Ranger basically takes the Rangemaster and puts it into stompbox form. If you are looking for a crystal clear boost pedal that will not affect your tone in any way, this ain’t it! 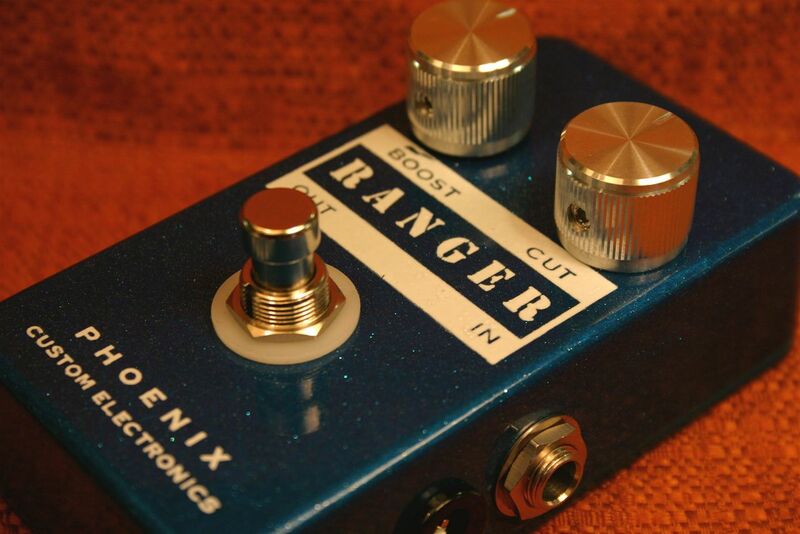 The Ranger uses a germanium transistor to boost your signal. It adds just a touch of that great sounding warmth and dirt to your tone, without being dirty enough to qualify as a fuzz or overdrive pedal. Use the Ranger to push your amp into natural tube overdrive and you won’t need or want a distortion pedal! This is the secret weapon of the Ranger; the thing that makes it different from the Rangemaster. The original Dallas Rangemaster was a treble booster, which worked very well if you were playing a humbucking guitar through an amp without much high end. If you try to plug a Tele into a Fender Twin and play through the Rangemaster on the bridge pickup, however, you will have WAY too much top end. The input capacitor sets the range that the Ranger will boost, so I’ve added a knob that gradually blends in a larger input capacitor as you dial it counter-clockwise. Now you can get the right sound for your particular guitar/amp combination. If you use different guitars, you may need to use different settings on the Ranger to get the tone you want. This is a trim pot located on the circuit board. The primary purpose of this pot is to set the voltage of the collector of the transistor. Germanium transistors are very heat sensitive, and their gain will increase as temperature increases. You can use the bias control to help offset the effect of temperature.